The internet has been a fantastic creation that has enriched our lives providing a source of entertainment, a way to connect with friends and family at all times, a powerful tool for business as well as many other useful and exciting things. However, the online world also has its dangers which have made many parents cautious about allowing their young children to explore it. From cyberbullying to accidentally sharing private information there are many risks that a child can face when online. Therefore it’s important we take measures to keep kids safe online. We want children to be able to use the internet for its benefits such as online learning, playing video games and talking to their friends, but it’s so important that we take steps to make sure they’re using it safely. Whether that’s setting up parental restrictions or installing safety software, kids can enjoy the online world without you having to worry. What potential dangers can a child face online? The internet can be a wonderful place, but we’d be naïve not to admit it has potential risks and dangers. Most of the time we are able to enjoy it for the good things it has to offer, but sometimes we have to face up to these dangers. 1.Cyberbullying: The definition of cyberbullying is ‘the use of electronic communication to bully a person, typically by sending messages of an intimidating or threatening nature’. This is arguably the most common threat children face online. It’s so easy nowadays with social media and online gaming for children to be mocked and threatened whilst doing something they’d usually enjoy. To protect children from cyberbullying we must encourage them to speak up and teach them what they need to do in the event that they are being bullied online. 2.Cyberpredators: Unfortunately, we live in a world where there are sexual predators that prey on young children and what’s even worse is that the internet has become a platform for predators to lure them into dangerous situations. Cyberpredators do this by using fake profiles on social media and online gaming accounts and taking advantage of the innocence of young children. Again, the best way to protect against and deal with this risk is to encourage children to speak up as well as making sure they’re old enough to be using these platforms as some social networking sites have age restrictions. 3.Disclosing Private Information: When using social media, generally speaking, an adult knows not to post any private information that isn’t meant to be out in the public. However, the majority of children aren’t mature enough to understand this and disclose things they shouldn’t online such as addresses and mobile numbers. In order to combat this parents and teachers should be responsible for educating children on how it can be dangerous to post private information and make them aware that it’s available for the public to see. There are many other potential dangers such as phishing and downloading Malware but the common thread in dealing with all these risks is educating children about the dangers and the best ways to overcome them. Leading on from the dangers they face and the importance of being safe when they are online, sometimes it’s a challenge deciding whether to buy children devices such as mobiles, tablets and gaming devices. When thinking about buying a child a tablet or anything else that has access to the internet, immediately the first thing that springs to mind is the potential threats that it could bring to a child’s safety. However, in our O2 stores, we stock the Alcatel Family Tablet Bundle with Azoomee, which is a fantastic device that gets rid of any of these fears. 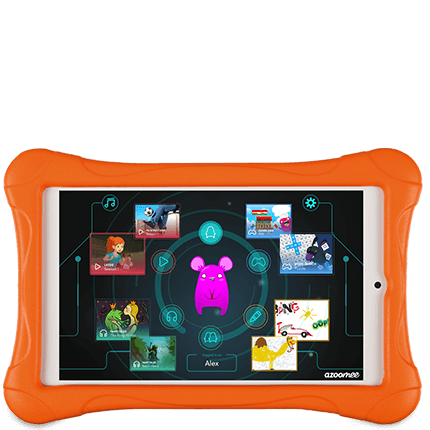 The bundle combines a fun and useful tablet with a 24-month subscription to Azoomee, software designed with the purpose of children only being able to access suitable content, which is a deal exclusive to O2. The Alcatel Family Tablet Bundle with Azoomee is the perfect solution to your dilemma as what online device to buy your child, particularly young children. It’s fun, it’s educational and most importantly it’s extremely safe taking the negative thoughts surrounding your child using the internet out of your mind. All in all, as we’ve already said we have to keep kids safe online, but at the same time ensure that they are still able to access the benefits the online world has to offer. The world has moved in the digital direction and it’s crucial children and young people are able to take advantage of it. It’s easily achievable to find the right balance mostly through education but also through software when needed.